Sauerkraut and pork...ah, what fond childhood memories that phrase evokes. I've expounded upon my German heritage quite often here at CO...sauerbraten, potato dumplings and red cabbage was one of the first dinners I wrote up for this blog, and my Oma's Potato Salad has been written up as well. But the sauerkraut and pork...now that's old school, deeply ingrained memory stuff for me, something my German grandmother and great-grandmother made often. Oddly enough, it is a cherished childhood memory for Mark too (shared heritage...one of the many reasons we make such a great pair in the kitchen. ) This one is Mark's recipe, and Mark's story. Mark's grandfather was Austrian (well, as far as we know). The family stories about him are legendary and probably not all true, but fun to talk about anyway - they range from everything from him being a horse thief to a Ruthenian terrorist to some sort of royalty. Whatever he was, he came to this country prior to WW1, married a Canadian woman, and raised a family in Boston. He worked various jobs, including being a Pinkerton...and cooking at a resort on Long Island. The story behind the cooking goes that he used to spend a lot of time in the kitchens of the estate he grew up on, and learned some pretty impressive cooking skills along the way. Sadly, I never got to meet Grampy (he passed away in 1978 in his late 80's), but I am lucky enough to be the beneficiary of that delicious heritage. And one of the best examples is this sauerkraut and pork, passed down from Grampy and Mark's Uncle Jim. I know I've said this about a lot of things, but this is truly one of my favorite, favorite things that Mark makes. A general note on the sauerkraut - we recommend the use of bagged. The bagged varieties seem to have a better flavor than the jarred, possibly because they are kept cold in the fridge instead of on the shelf at room temperature (which would mean that they are probably pasteurized). If you can't find bags (usually kept near the hot dogs) use jarred. Canned sauerkraut just tastes like the can, and should be avoided if at all possible. 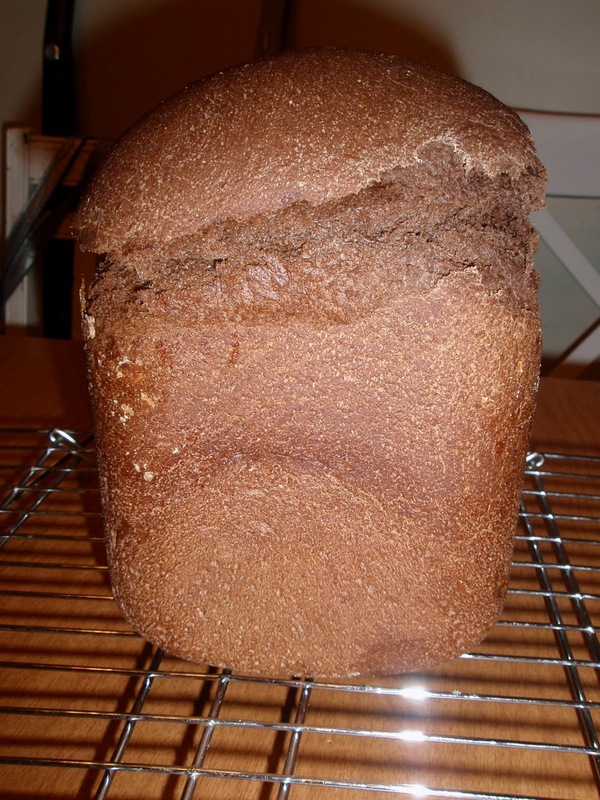 Potato pancakes and pumpernickel go perfectly with this - my bread machine version of pumpernickel follows. If you have the time and inclination, by all means make the pancakes from scratch...but we find the boxed mix (Carmel Kosher or Manischewitz) work perfectly fine, particularly if we have other things going on while the sauerkraut simmers. 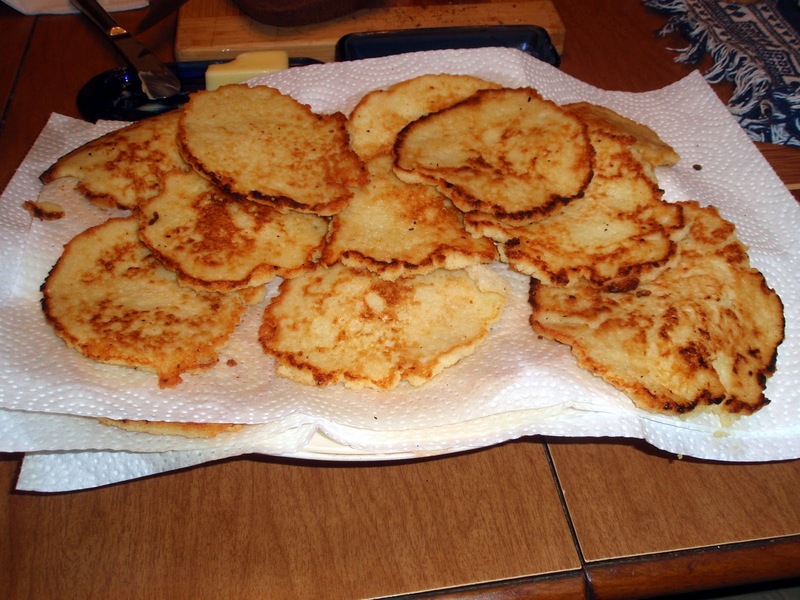 Potato dumplings (see link above) or even pierogies would be great with this as well. We usually double this recipe, but I am giving directions for a normal potful here. The onion, apple and pork measurements are approximate - it all depends on the size of the apples and onions, and the meatiness of the pork. Exact measurements are really not important on this one ! first layer ready to go ! Place half of the sauerkraut in a large stockpot. Scatter half of the onions on top, then half of the apples. Lay half of the pork chops on top, and sprinkle with half of the mustard, caraway, and pepper. Repeat with remaining sauerkraut, onions, apples, pork and spices. Combine water and vinegars and pour over contents of pot. Cover tightly and bring up to a boil, then reduce to a simmer. Leave undisturbed for two hours. After the two hours is up, remove lid and stir well (the meat will probably start coming off the bones at this point). Cover again, and simmer for another hour or two (you can probably get away with one, but Grampy always said the longer the better). Add the pickle juice (stirring well) for the last 15 minutes of cooking. 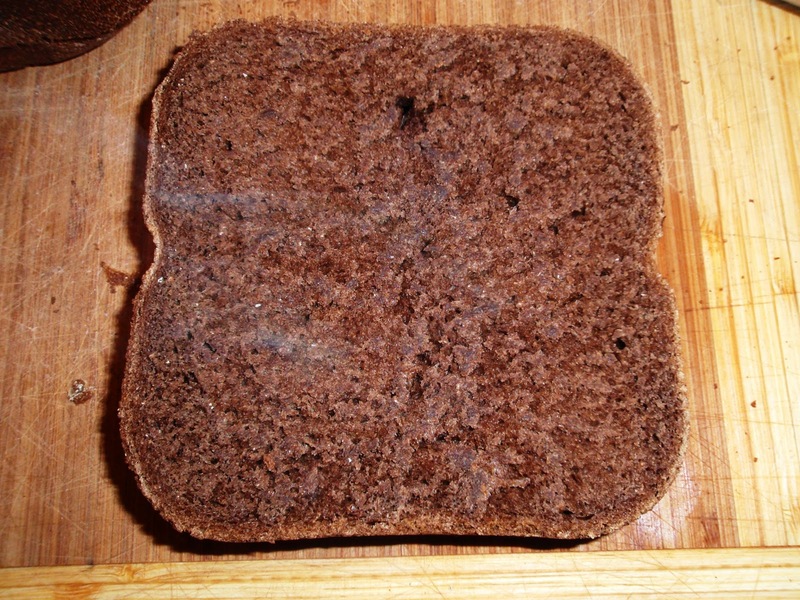 True fact : "Pumpernickel" means "Devil's Fart" in German. I love that :) . Traditional pumpernickel is baked from 16 - 24 hours to get that deep, dark color - or darkly toasted crumbs from the previous batch can be added. 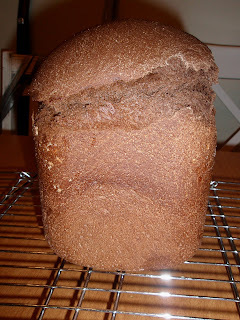 This one's a bit of a cheat, relying on a combination of dark, tasty ingredients...and a bread machine. Don't let that scare you off - it's still absolutely delicious ! 1/4 cup Guinness (if you don't have one handy and open, just use regular beer or add more water. Guinness helps make it super dark though ! You could probably use cola as well). Add ingredients to bread machine in order specified by manufacturer, and bake according to directions for "normal" or "basic" loaf. I really was not a fan of beans as a kid. I think I was afraid they all tasted like canned baked beans, which were one of the very few foods I simply would not eat - and of course, being half-raised by New England Yankees meant this was a problem come Saturday night. I'd get down a few hot dogs and a ton of brown bread, but the beans...those went to Sput (the dog :) ). It was only when I got older and realized that beans came in varieties other than canned baked that I realized how much I'd been missing. Now I love them, any way I can get them. 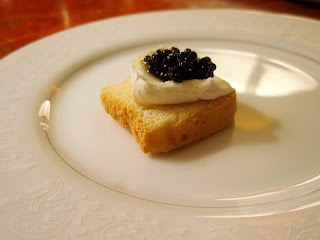 I've already blogged about a few of my favorite bean dishes- cassoulet , frijoles borrachos - but this was a new one for me. This dish was one of those things that just sort of happened, for a number of reasons - one of which was the frijoles, actually. The last time I made them, I soaked way too many beans and there's been a bag of them taking up space in my overstocked freezer ever since. We also had our very first snowstorm of the season today, and I really didn't relish going out for any more ingredients. Mostly, though, it was because our planned ham dinner didn't happen on account of a nasty virus going through the house. One resident foodie was down for the count, but the other one requested soup - and as I was out of carrots and celery (and the snow was flying), it was going to have to be a soup that didn't involve either. 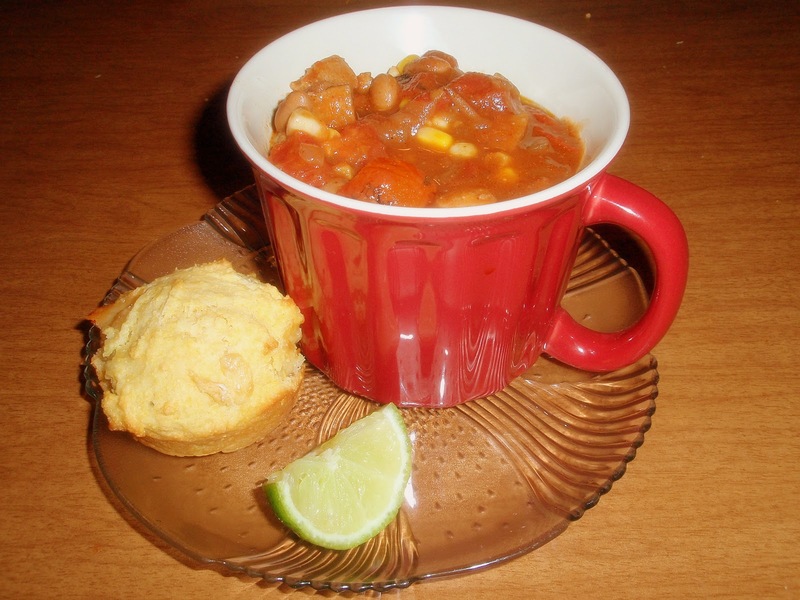 Voilà - pinto bean soup. Of course, I didn't photograph it as I was making it, because I didn't think it was going to amount to much (I mean...no carrots or celery ??) Imagine my surprise when it was absolutely amazing, and something I'll definitely make again. My soup is somewhat based on this recipe, though with quite a bit of adjustment. As for the bacon drippings, as with most things beans are always better with bacon, and I do usually keep some frozen for just this sort of occasion. Just let the drippings cool, then run then through a strainer before you freeze them. It's a good idea to do them in small quantities (ice cube trays, snack size baggies etc) so it's easier to just grab a bit when needed. However, if you're not quite as crazy as me and you don't have any drippings handy, oil would work perfectly fine in this recipe - just adjust for salt if needed. In a heavy kettle sauté onions and garlic in bacon drippings over moderately high heat, stirring, until pale golden. Add chili powder, paprika, chipotle and cumin and cook, stirring, for about a minute, or until you can really smell the spices. Add drained beans and the stock and simmer, covered, until tender, about 1 to 1 1/4 hours. While soup is simmering, in a skillet brown chorizo over moderately high heat and transfer to paper towels to drain. Add chorizo to soup with tomatoes, corn, enchilada sauce and salt to taste and simmer, covered partially and stirring occasionally, 30 minutes. Serve with lime wedges. This may come as a bit of a shock, but come New Year's Eve we tend to be sort of homebodies. I know, it's a big going out, eating well, drinking better night and all - and we're all about those things, believe me. Except, for some reason, this night. I think it started when our son was small - no one really wanted to stay home and babysit, and his little smiling face was the first thing I wanted to see for the new year anyway. Now, of course, the face is much bigger - and a little bit pickier when it comes to eating well. Mea culpa, I know...anyway, now I just sort of like hanging at home with the family and cooking up something yummy. 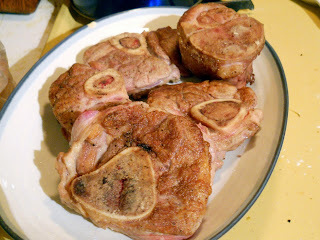 This year, Osso Bucco seemed like a fine dish to make for a festive night at home. Osso Bucco is one of those wonderful Italian dishes where they take a relatively cheap cut of meat (in this case, veal shanks - Osso Bucco literally means "bone with a hole" in Italian), and braise it in wine and aromatic veggies for a long long time until it is a picture of falling-off-the-bone deliciousness. It is most often served with risotto, which is certainly something we're a fan of here - but we had just had my mushroom risotto for Christmas dinner. 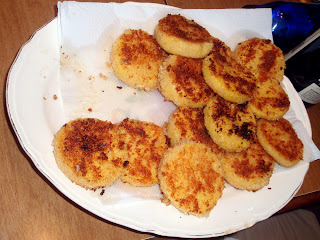 We needed very little convincing to do it over polenta instead...because really, when is it not a good time for polenta ? Preheat oven to 350. Pat veal shanks dry with paper towels to remove moisture. Season the shanks with salt and pepper. Dredge them in flour, shaking off excess. Since I haven't posted in so long...maybe just a picture will do. This was one of my Christmas presents, which I somehow held off eating until New Year's. Lucky me ! !